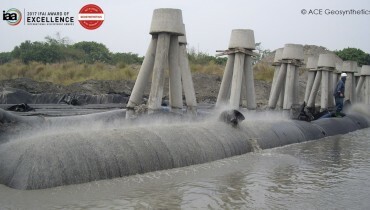 ACEFormer™ are two-layer and high-strength geotextile mattresses grouted with cement mortar or concrete for coastal erosion control, channel construction and pipeline protection. 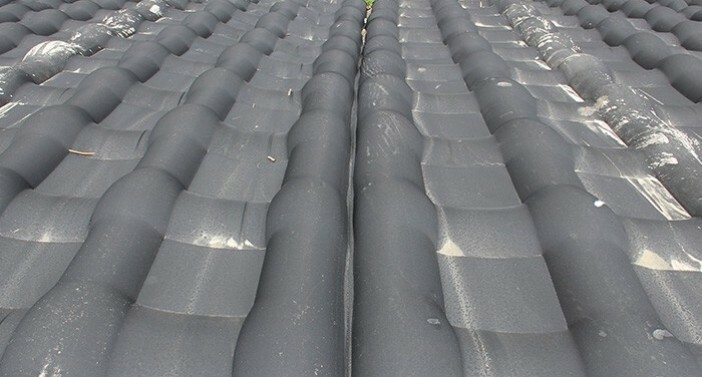 The geotextiles mainly woven by PP and/or PET yarns are able to accommodate different landforms, and provide a formwork to construct a surface protection structure. With the filling material, the ACEFormer™ system provides an effective shield and medium against erosion, and to reduce the wave energy and flow velocity on the applied surface. 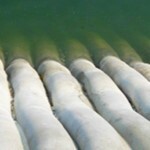 ACEFormer™ geotextile mattresses fabricated with high strength and flexible geotextiles can be easily installed with good attachment to the ground below or above the water. The high tensile strength of ACEFormer™ increases their bearing capacity to the downward force and ability to control thickness while installation. 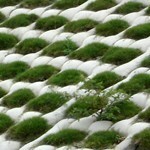 Therefore, ACEFormer™ geotextile mattresses can be used on steep slopes and high flow-rate channels. Furthermore, they have excellent permeability characteristics to discharge the excessive mixing water. After the filling process, ACEFormer™ can effectively resist to hydraulic energy and reduce waves run up by its undulating surface. Customized design and production of ACEFormer™ geotextile mattresses are available for different designed functionalities. Basically, ACEFormer™ have six basic types which are introduced below, all offering more efficient and economical solutions than traditional methods such as reinforced concrete, gabions and rip rap, etc. 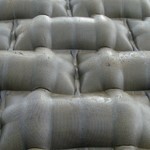 The ACEFormer™ FP Type geotextile mattresses are double-layer woven fabrics with many small permeable areas from 25 to 65cm2 to form single-layer fabric called “Filter Point". 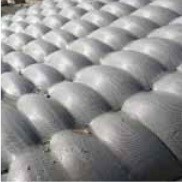 The Filter Point can release the water pressure beneath ACEFormer™ geotextile mattresses to increase the stability of the structure. Filled ACEFormer™ with undulating surface can reduce energy of wave or river flow to lower the flow velocity and wave run-up. 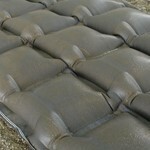 The ACEFormer™ V Type geotextile mattresses are resembled from the FP Type. 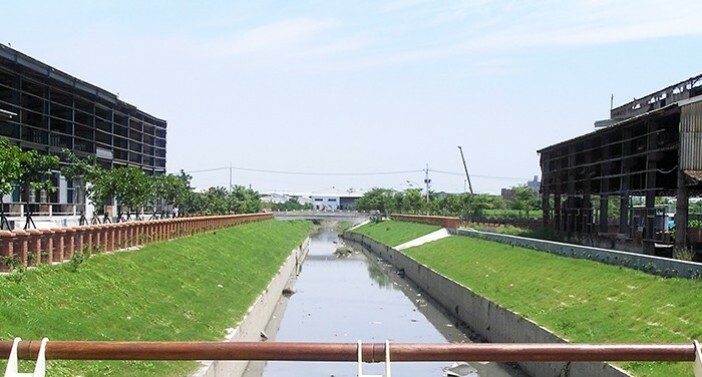 They have well-distributed filter area made of permeable fabric with 900cm2 areas which is larger than FP Type; these also can be removed for planting or vegetating purpose. Once the planting completes, the root of plant could firmly grip the soil to stabilize slope and the plant or vegetation increase the coefficient of hydraulic friction to resist the water erosion as well. 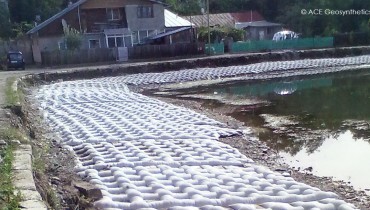 The ACEFormer™ L Type geotextile mattresses are designed to create the discontinuous and four-square block with about 2,500cm2 areas of L-shape filter fabrics. Adjacent blocks are merely jointed by multitudinous narrow joints. The aim of the innovative product is to shun the comprehensive failure of unpredictable and serious disaster. The blocks will be an independent one as long as the joints fractured. 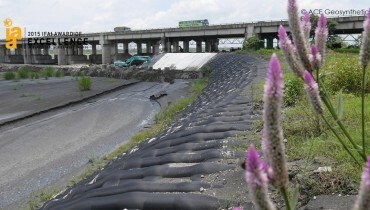 Considering having bigger and heavier independent block for extreme project condition, the ACEFormer™ T Type geotextile mattresses may be an appropriate solution for engineers. The properties, application fields and advantages are equivalent to the L Type but with bigger block area of 5000cm2. ACEFormer™ T Type are formed by couples of symmetrical T shape filer fabrics and will be a rectangular block as long as being filled. 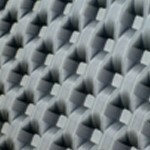 The ACEFormer™ Pipe Type geotextile mattresses are the variation of FP type formed of numerous stripe type filters to divide into the longitude blocks. 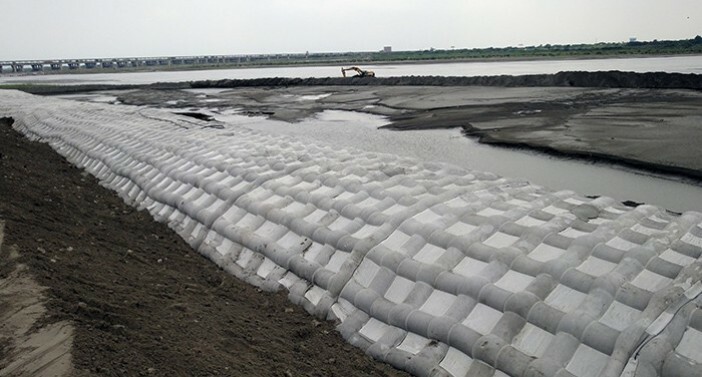 With these longitude blocks and larger filters, the geotextile mattresses can reduce the flow velocity and hydrostatic uplift pressure. 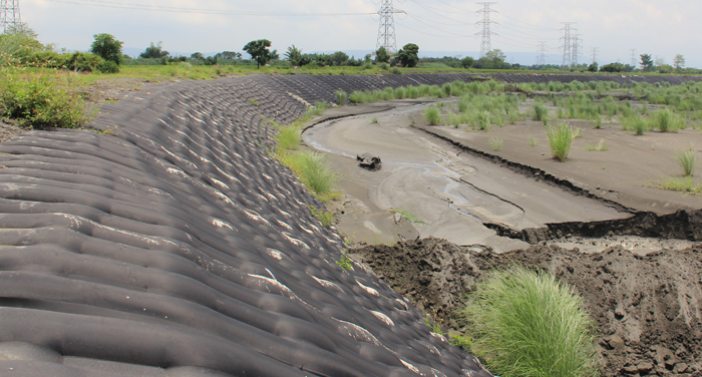 The ACEFormer™ Uniform Section Type geotextile mattresses provide a continuous protective layer with uniform thickness in the range of 20 to 50cm; it can prevent from leaching and provide more resistance to the wave attack or river flow erosion than other types.